Kumquat, or cumquat, is the common name for any of the evergreen shrubs or small trees comprising the genus (or subgenus) Fortunella of the flowering plant family Rutaceae, characterized by dark green foliage, white flowers, and small, oval or round-shaped, orange-yellow fruit (when ripe). The name also is used for this edible, orange-like fruit, of which both the thin, sweet rind and the mildly acidic and juicy pulp may be eaten. Fortunella often is considered as a subgenus of the Citrus genus, being closely related to oranges, lemons, limes, citrons, grapefruit, pomelos, and mandarins (tangerines). The flowers and fruits of the kumquat not only provide for the individual reproductive function of the plants but also serve a larger function for the ecosystem and for humans (see bi-level functionality). Ecologically, the fruits provide food for various animals while the flowers provide nectar and pollen for pollinating insects. For humans, the fruits are popularly eaten raw, or as a garnish, or even cooked, candied, or made into jams, jellies, or marmalades. In addition, the kumquat is very common as an ornamental plant, offering green foliage, sweet-scented white flowers, and brilliant orange-yellow fruit. Kumquats are a group of fruit-bearing plants in the orange family Rutaceae. They commonly are classified as comprising the the genus Fortunella, but some authorities believe they would better be included in the Citrus genus within Rutaceae. The edible fruit, which is also called kumquat, closely resembles that of the orange (Citrus sinensis) but is smaller and is often oval. Kumquates are slow-growing, evergreen shrubs or short trees, from 2.5 to 4.5 meters (8 to 15 feet) tall, with dense branches and sometimes bearing small thorns. The leaves are dark glossy green, and the flowers pure white, similar to other citrus flowers, borne singly or clustered in the leaf-axils. 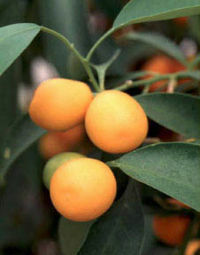 The kumquat tree produces 80 to 100 fruit each year. The tree can be hydrophytic, and fruit is often found floating near the shore during the kumquat season. In appearance, the kumquat fruit (generally called simply "kumquat") resemble a miniature orange, about 3 to 5 centimeters (1.2 to 2.0 inches) long and 2 to 4 centimeters (0.8 to 1.6 inch) wide. The shape may range from round, such as in the Marumi kumquat variety, to oval, such as in the Nagami kumquat variety. Depending on variety, peel color ranges from yellow to red. A Nagami kumquat has an oval shape, while a Marumi kumquat is round. Kumquats originated in China (they are noted in literature dating to the twelfth century), and have long been cultivated there and in Japan. They were introduced to Europe in 1846, by Robert Fortune, collector for the London Horticultural Society, and shortly thereafter into North America. Originally placed in the genus Citrus, they were transferred to the genus Fortunella in 1915, though subsequent work (Burkill 1931, Mabberley 1998) favors their return to inclusion in Citrus. Fortunella crassifolia (syn. Fortunella crassifolia)—Meiwa kumquat. Generally eaten fresh, skin-on, instead of cooked. Fortunella japonica (syn. Fortunella japonica, C. margarita, F. margarita)—Marumi or Nagami kumquat. Tart, prized for staying fresh on the tree longer, generally cooked or peeled. Kumquats readily hybridize with other members of the genus Citrus and with the closely related Poncirus. These hybrids are known as Citrofortunella; examples include the limequat, orangequat, and calamondin. Kumquats are cultivated in China, Taiwan, Southeast Asia, Japan, the Middle East, Europe (notably Corfu, Greece), and the southern United States (notably Florida). Kumquat fruit is generally in season from late autumn to mid-winter, and can be found in most food markets with other produce. Kumquats are much hardier than citrus plants such as oranges. The "Nagami" kumquat requires a hot summer, ranging from 25 to 38°C (77 to 100°F), but can withstand frost down to about −10°C (14°F) without injury. It grows in the tea balls of China where the climate is too cold for other citrus fruits, even the Mikan (also known as the Satsuma) orange. The trees differ also from other citrus species in that they enter into a period of winter dormancy so profound that they will remain through several weeks of subsequent warm weather without putting out new shoots or blossoms. Despite their ability to survive low temperatures, as in the vicinity of San Francisco, California, the kumquat trees grow better and produce larger and sweeter fruits in warmer regions. Kumquats are rarely grown from another kumquat seed because they do not do well on rooting. In China and Japan, they are grafted onto the trifoliate orange (Poncirus trifoliata). This has is found the best rootstock for kumquats in northern Florida and California and for dwarfing for pot culture. For this reason they are often known as "dwarf fruit." Sour orange and grapefruit are suitable rootstocks for southern Florida. Rough lemon is unsatisfactory in moist soils and tends to be too vigorous for the slow-growing kumquats. Kumquats are a rich source of vitamin C and a good source of vitamin A and potassium (Herbst 2001; Bender and Bender 2005). The fruit is considered ripe when it reaches a yellowish-orange stage, and has just shed the last tint of green. Kumquats are eaten raw most of the time. As the rind is sweet and the juicy center is acid, sour, and salty, the raw fruit is usually consumed either whole, to savor the contrast, or only the rind is eaten. The Hong Kong kumquat has a rather sweet rind compared to the rinds of other citrus fruits. Culinary uses include being made into candied fruits and kumquat preserves, marmalade, and jelly. They can be pickled whole as well (Herbst 2001). Kumquats appear more commonly in the modern market as a martini garnish, replacing the classic olive. They can also be sliced and added to salads. A liqueur can also be made by macerating kumquats in vodka or other clear spirit. 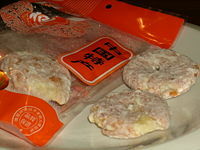 The Cantonese often preserve kumquats in salt or sugar. A batch of the fruit is buried in dry salt inside a glass jar. Over time, all the juice from the fruit is extracted through dehydration into the salt solution. The fruit in the jar becomes shrunken, wrinkled, and dark brown in color, and the salt combines with the juice to become a dark brown brine. A few salted kumquats with a few teaspoons of the brine/juice may be mixed with hot water to make a remedy for sore throats. A jar of such preserved kumquats can last several years and still keep taste. Kumquats also are a popular ornamental tree. In Vietnam, kumquat bonsai trees are used as a decoration for the Tết (New Year) holiday. The English name "kumquat" derives from the Cantonese pronunciation gam1 gwat1 (given in Jyutping romanization; Chinese: 金橘; pinyin: jīnjú; literally "golden orange"). The alternate name 柑橘, also pronounced gam1 gwat1 in Cantonese (gān jú in Mandarin, literally "large tangerine orange") is now more commonly written by Cantonese speakers. Burkill, I. H. 1931. An enumeration of the species of Paramignya, Atalantia and Citrus, found in Malaya. Gard. Bull. Straits Settlem 5: 212–220. Mabberley, D. J. 1998. Australian Citreae with notes on other Aurantioideae (Rutaceae). Telopea 7(4): 333-344. This page was last modified on 20 January 2009, at 01:03.